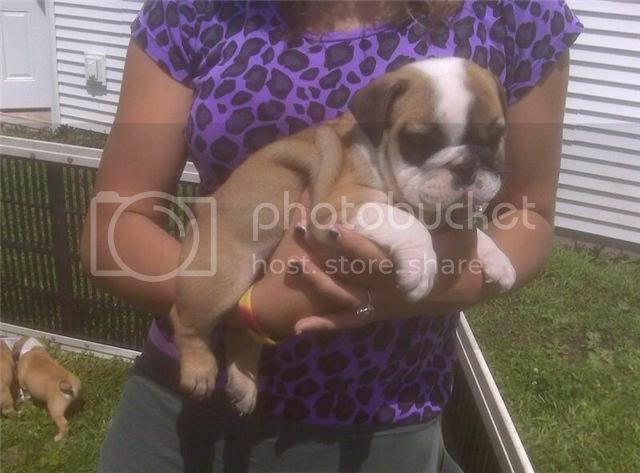 Hi I need some help in choosing between 2 puppies from bulldog owners who might know from their own experience. What personality is easiest to train........a puppy who is laid back, mild mannered, watch everyone else or one who is curious, inquisitive the first to figure everything out and knows what he wants. This will be my first bully and I have no idea which personality to pick. They are both males and just over 6 weeks. I only have a few hours to decide and would apreciate any input...thanks. At only 6 weeks old they really haven't deveolped their true personalities yet. Its best to speak with the breeder and see which puppy they suggest would best suite your lifestyle, if its a good breeder they should be more than willing to give you more info on each puppy to help you make the best choice! I agree with weber although if you had to choose based on that info I would have to go with the mellow one. Doesnt mean they wont be the crazy curious one in the end tho. I say you cant go worng with either, go with your gut. And hurry up and post some pics! Darn!! !......I wanted someone to decide for me, lol. I want the lazy, mellow pup and my husband and daughter want the curious one who follows you everywhere. The breeder has done a good job describing the personalities and either one would fit. I will definitely post some pics. If it were me.... the one that is curious, But which ever, you will love having a bully in the house. I have one that sits on the couch and the other who like to chew on the couch and climb to the highest point of the couch so she can jump off it onto whoever is walking by. AH HA......I knew it!! I am so losing the battle.......the bully is for my daughter but in the fall she finishes her last year of college, add her job, social life and the raising and watching of the puppy will be my problem. I want the lazy puppy! I still have some time to plead my case. The worst thing is in the picture the breeder sent yesterday of the funny, sassy, inquisitive bully shows him so cute and so docile my husband and daughter told me I am worying over nothing. Here's his picture.....see what I mean! Oh no! Get him! He's too cute! Either way, the bully is gonna be the boss of you. Good luck! Stripe is so cute! I had the same problem a couple months ago. My husband and son wanted the puppy with more personality, his brother was more laid back and I wanted him. Hubby and son won and I tell you what, I don't regret getting my little monster one bit. He provides so much happiness and unlimited laughter he's good for the soul. He is cute I couldnt resist that mug either.